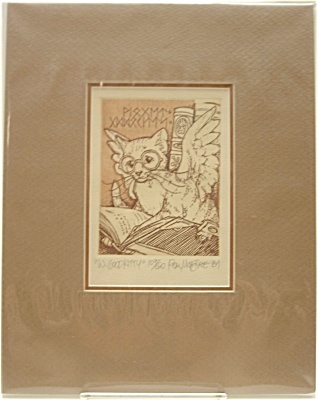 This is a single-color, hand-pulled, original intaglio etching in shades of brown, named, numbered, signed and dated in pencil at the bottom. Printed onto ivory rag paper and matted with brown and light brown boards. The "W" stands for "Widget," as spelled out in runes in the background. This artwork is in a protective plastic sleeve. Any glare is from the plastic and not part of the art work.